Law firm in India - Tax, IPR and Corporate Law Practices Is your contract safe ? Is your Contract Safe ? Home Arbitration In India Commercial Agreements & Contracts In India Is your Contract Safe ? Precautions are must to be taken in a Contract to make it Safe. A business transaction between two or more parties are summarized and documented to make it enforceable in law. AMLEGALS consider a contract to be “Heart & Soul” of any business. This legal intelligence series is intended to focus on elementary guidelines on best practices in Contract Drafting. A Contract should be in the simplest possible manner to convey the same meaning for which it has been executed and intended for. The biggest and toughest challenge should be to simplify and aim for the simplest drafting of a Contract so that all concerned, including stakeholders, can fully understand its intention and meaning without any extra effort. The words, expressions and sentences deployed in the Contract should not give any other meaning than the intent and purport for which it has been executed. If it is vaguely drafted then the laws of interpretation have to be resorted to for understanding its intention and meaning. It is a well known fact that “laws of interpretation are good servants but bad masters”. The prime focus should be to avoid anomaly while choosing any word and expression and every sentence should be meticulously drafted in the body of the Contract to give such an effect. Hence, simplicity should be the priority in mind since the beginning till its end. Does it serve the team’s requirement? Every Contract is made to serve and achieve different requirements. However, success of any Contract requires that every individual involved in the Contract cycle has same perspectives, words, values, goals, methods, etc., to execute and implement such a Contract. There has to be clarity in every aspect, specification, quality, quantity, milestone, time, expectation, manner, module, method and monetary terms so that there is no confusion at any end of the team. Does your Contract have a complete body? A Contract should have a complete body to incorporate every provision. Definitions, scope of work/service, obligations, commercial liability, documentation & invoicing, validity, accountability & delay, documentation, termination, waiver, IPR protection, force majeure, dispute & settlement, applicability of law, survival clauses, place of performance/supply, business secrets, non-competitive clauses, non-solicitation, non-disclosure, amendments, severance, etc. One must realize that much of what happens in practice won’t be what was contemplated in the original Contract. Every Contract needs to be futuristic in a way to anticipate every possible transaction, implication, issues, complexities, solutions, etc., during the tenure of such a Contract. Does it talk about accountability? Every Contract talks about obligations and responsibilities but Contracts most often lack accountability. The accountability is must for documentation especially in Civil, EPC and Service Contracts. The Contract should emphasize on copies of plans, drawings and specifications and where appropriate, a Bill of Quantities or Schedule of Rates and Prices as well. It should also have mandatory provisions for certification to account any completion, specific measurable deliverables and reporting requirements, inspection and audit provisions including due dates and should be interlinked with commercial liabilities or payment under a specific Contract. Progress is more important than perfection and hence every Contract needs to be reviewed at regular intervals and amended, altered and/or changed to avoid unforeseen liabilities. The review can be due to change in conditions, taxes, laws, obligations, Re-negotiations, etc., and hence review is a must practice to make it safe and healthy at any given point of time. Every Contract should have clear provision incorporated towards limited liability, damage and/or penalties applicable at any given point of time. A specific clause to such an effect can prevent every company from unforeseen liabilities and business losses during and/or after Contractual period towards any claim of consequential, incidental, punitive or any indirect damage claim as well. Is the Contract properly managed? A good Contract can also become “weak and prone to liabilities” if it is not properly managed. Companies often observe suicidal practices when it comes to Contract management as they resort to mechanical and stereotypical Contract management. It requires very high due diligence and artificial intelligence to have an effective Contract management. It is a continuous and never ending process for every company and should be seriously dealt with. Are concerned departments working in a loop? Every company should have involved person(s) identified and written down from every stage of execution of any Contract. Any replacement should be also pro-actively accounted for. The simple rule of “Who is Involved and Who Benefits” has to be exercised every time with due diligence. This can strengthen the position of every company to face every situation arising out of a Contract. Does it provide for effective Risk Management? Businesses go with a profit centric approach and this requires risk averment at any and every stage of its cycle. Risk management in a Contract starts with the factum that everything related to business is documented in the first place as an effective Contract. Risk Management comprises the suitable provision for protecting, safeguarding and sealing every possibility of infringement and/or compromising of drawing, design, trade secret, intellectual property, data, information, research and development, monitoring of processes, protection of company assets, minimization of exposure to risk of litigation, and increased costs. The best practices being usage of most updated terms & conditions in every new Contract, avoidance of copy paste templates, pre-determined business processes, fixing of documents linked payment, constant monitoring of a Contract in a holistic manner, preventing trade secrets, timely communications on every breach, contravention, obligations, corrective actions and/or initiation of preventive litigation actions, etc. The preventive litigation management also requires that every Contract should address the risk prone areas in a most specific manner so that it can be averred in future. 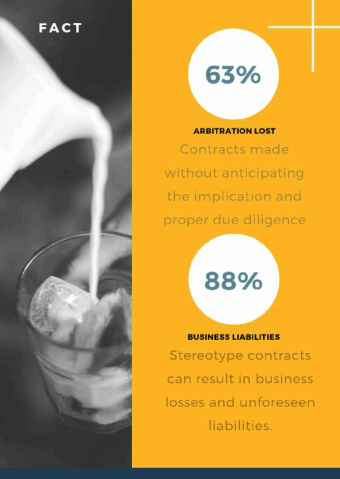 Is your Contract providing a Close-Out Mechanism? Every Contract should have an inbuilt close-out mechanism with Contract close-out checklist and a team responsible for the same to co-ordinate it effectively. Person identified with responsibility after Contract closure. This becomes very significant when dispute arises out of a Contract. Is your Contract provided with in-built guidelines? A Contract is drafted and even vetted but a self guiding mechanism is never thought of in any Contract. People often get stuck in differentiating between terms and conditions and guidelines for a Contract. Almost 30% times, a difference or dispute does not take the shape of a commercial litigation where a company bothers to have inbuilt guidelines in place. Every Contract should have provisions for corrective action towards every non-performance within stipulated time, with a dispute resolution process associated thereto. It safeguards the exercising of the rights and obligations of both the parties in very effective manner. Does it contain an effective Arbitration Clause? It must be realized that it is the most copy pasted clause in almost every Contract. The most unfortunate part is that this is often left loosely drafted as well. It must be noted that 17% time arbitration is initiated after going through a battle phase for appointment of an arbitrator. Is your Contract lacking the required characteristics? Is your Contract legally vetted? Legal vetting of a Contract works at par insuring any business from unforeseen liabilities, losses and damages. It must be realized that a pre-determined template & stereotype Contract with copy pasted terms and conditions, usage of usual sentences, un-anticipated drafting etc., can be suicidal for any business. Legal vetting results into an assurance that the Contracts generated contain the complete and correct version of the terms and conditions, laws, taxes, safeguards, commercial security, liabilities, legal remedies and other aspects defined in a legally safe manner. Disclaimer: The information contained in this document is intended for informational purposes only and does not constitute legal opinion, advice or any advertisement. This document is not intended to address the circumstances of any particular individual or corporate body. Reader should not act on the information provided herein without appropriate professional advice after a thorough examination of the facts and circumstances of a particular situation. There can be no assurance that the judicial/quasi-judicial authorities may not take a position contrary to the views mentioned herein.